The "Bag in Box" package (BIB) was invented by Williams R. Scholle in 1955 as a container for liquids. It is made up of an interior bag made of a laminate material, which is mechanically protected and supported by a corrugated paper box. The box also provides a display function since its exterior can be branded. The usual size of a BIB container is 18lt; various sizes are available. The interior bag is filled by the producer with non-carbonated liquid / syrup, closed with a spigot and then placed in the covering box. The restaurateur opens the precut window of the covering box and connects the bag to a dispenser. The Sinalco syrup is then mixed with carbonated water shortly before serving. The BIB system has the advantage of not allowing any air to come into contact with the liquid to be served. Moreover, BIB packaging is one-way and space-saving: it can be easily disposed by separating the bag from the box. It is also very efficient for shipping purposes since a large volume of product can be handled with a small shipping volume. 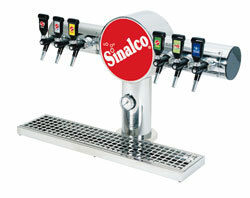 The company of refreshments Sinalco in the island of Rodos was and is always near in the youth and the sports. This factually shows it with its sponsorings in various teams of island that are their main sponsor each year.